At our house, it takes us about a month or so to recover from the Christmas season. It's time to put away the tree and the ornaments, pack away the wrapping paper and bows, replenish the Scotch tape supply. It's also time to throw out the dozens of free CATALOGS that arrived in the mail from just after Labor Day all the way past Thanksgiving. And if you're a business owner selling products, it's the perfect opportunity to start attracting the attention of prospective buyers like yourself. A product catalog is a great way to do this. With product catalogs, not only are you able to explain the features and benefits of what you are offering, but also show potential customers, in full color, your products and services. Since a lot of people are visually oriented, seeing the actual item makes people more comfortable and confident in what they are actually purchasing. Having a catalog of products or services printed may be an overwhelming project and there should be a certain amount of research done prior to choosing a commercial printing company. When it comes to product catalogs, the details matter. The catalog cover should be bright and grab your attention. Start with your catalog cover, both front and back. This is the first thing customers will see and it should make a great first impression. This is expected to make the very first big impression. What kind of paper stock will you use for the cover? Will it be thicker than the rest of the pages? Glossy or matte? What artwork or photograph will you use? What colors? What words you use should also be concise, not cluttered. If your cover does not make someone eager to open the catalog, go back to the drawing board. The interior of your catalog should contain appropriate artwork and paper stock. Now that the cover is done, it is time to focus on the details of what is in your catalog. Here, the type of paper stock you use is even more important in making the right impression. Placing pictures of custom, high-priced items, such as wedding rings or yachts, on newspaper stock does not make the right impression. Conversely, photographs of everyday items, such as screwdrivers and hardware, on high-quality, glossy paper is unnecessary. The way in which your catalog is bound will depend mostly on the overall thickness of the finished product. 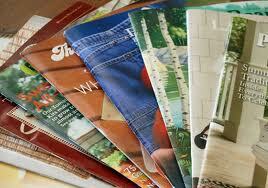 Thinner catalogs can be center-stapled; thicker ones will require perfect or stitched binding. Find out what bindery and finishing capabilities your printer has available. Make sure you proofread the catalog multiple times before allowing it to go to press. Nothing turns people off more when buying something than to have a simple misspelling or a product description under the wrong photograph. Finally, before you have the catalog printed, ask your printer if they provide mailing services. It is much less time-consuming for you to have the printer handle the distribution of the catalog. Some printing companies also offer fulfillment services, where the customer returns a POSTCARD for a free POSTER, for example, and the printer mails your customer the poster and then captures the customer's data for you. If you would like to discuss having a catalog printed, mailing services or fulfillment services with us, please CONTACT US or call one of our professional client service representatives at (520) 571-1114.